For those of you who have been around Windows Phone for a long time, you should know of Weave news reader as it’s been one of the hallmark apps on our platform since the beginning. Always fast and fluid, the app was an exceptional RSS reader and we always recommended it. Starting with the last update and now version 8.0 just released today, Weave is now more than just RSS as it’s a professionally run service that goes beyond just ripping feeds from sites. That’s the reason for its seemingly high $9.99 price tag (don’t worry, there’s a free ad-supported version too). No doubt that is a lot of bread but the reason may be worth it if you’re a news feed junkie. Weave doesn’t just pull RSS feeds but rather articles go through their servers first which reformat it, remove excess HTML coding, prep YouTube videos for viewing and make the article format universal and flawless. End result? You get low-bandwidth usage, fast loading articles with superb formatting for mobile use. You see a video image? Just tap and play. As far as we know, no other app on Windows Phone does all of that and its those server costs that result in a higher app price tag. 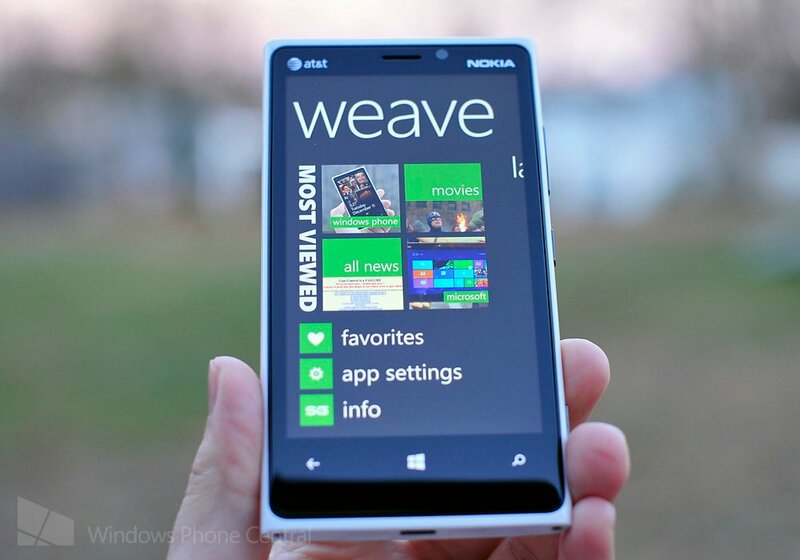 With version 8.0, Weave is finally a full native WP8 app. That means a doublewide tile, Lockscreen image support, a massive increase in performance, higher resolution graphics and more features. One of the neat features we really dig is the ability to read an article back by tapping a button—the experience is fluid and we really like the little graphic while the app is speaking. Lockscreen support is neat as is pulls down images from the latest headlines (you do have to wait until it updates though, so it’s not “instant”). One knock is the independent Live Tiles though—as you can pin each category to your screen but their images will all be the same, as opposed to reflecting each category. However, we’re sure that’s a simple oversight and could easily be addressed in a future update. Speaking of categories that’s one neat feature of Weave as it has pre-selected news sources for various topics. That means you won’t start with an empty news reader as the app will populate with various news stories from top-rated sites. Want to add your own feeds? Go right ahead as the app allows you to add or delete any news feed on the fly. Weave has always been a great app and with version 8.0 (paid and free), the app continues to be a shining example of an excellent news reader. 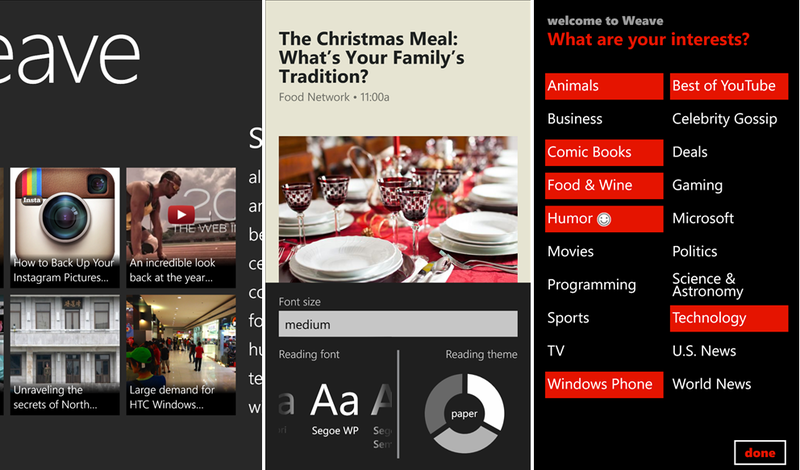 It’s fast, fluid and just looks gorgeous on our Windows Phone 8 devices. For that reason, we have to give it a thumbs up. Pick up Weave ($9.99) here in the Store or give the ad-supported free version here a spin if you just want to try it out. Windows Phone 8 only and previous purchases are updated for free.